Bluestem: She’s a brute. I mean, beaut. 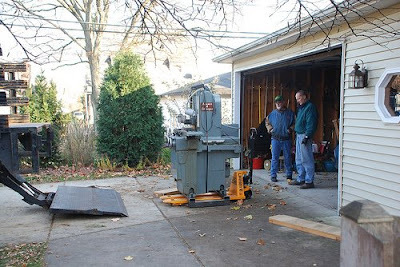 Yesterday we moved a 3000 lb giant machine into our garage, and I've never been more scared in my life. So, N drives up in the biggest rental truck ever. On the back, is, of course, Big Bertha. The truck has a mechanical lift on the back that’s rated to 3000 lbs. Which is good. And the lift is very small. Which is not good. Please note that the lift doesn’t have any lip or edge of any kind. So if we push the grinder a little too far, what we’ll have is a 3000 lb worthless metal roadblock in the driveway. I have to say, not getting maimed/killed was really my top priority for the day at this point. N had borrowed a pallet lifter from work. It's the orange thing in the second photo. We had already had a steel pallet made and bolted to Bertha. The pallet lifter is basically all manual. With the lifter you can jack Bertha up, but then N and I have to push and pull the giant thing by human effort alone. Carefully. We’re just getting warmed up and are pushing the pallet lifter around on the truck when one of our neighbors, Bruce, happens by. 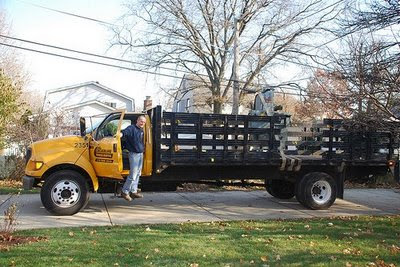 He’s just had major back surgery, but he knows about moving heavy stuff around, from his job as a maintenance guy at U of I. He stood around and gave us advice, which sounds totally annoying, but actually was a lot of help. You’ll notice that there are photos with Bertha on the truck and photos with Bertha on the ground. The part in between was much too nerve-wracking to document. It involved a lot of maneuvering and then Bruce held the lift switch while N and I held a strap around Bertha to keep her from wobbling off the platform. “Don’t wrap the strap around your arm,” said Bruce. “If it starts falling, just let it go,” said N. I quietly wet myself. Well, it's all sunshine and roses from here on out. When N builds out the side of the garage, we’ll have to get a pallet lifter again to move her into her final position. That will be a complete breeze compared to yesterday. We are NEVER doing anything that stupid again. We’ll be spinning carbide into gold by spring. Yes, but what does Bertha do? Why was it so important to bring her to the garage? Is she an escapee from Indiana's caverns of industry? Will she be gainfully employed? Now that is cool -- takes me back to my summer as the warehouser at a paint warehouse. I learned me all kinds of practices that OSHA would've written us up for, like how to use a drum dolly to get an 800-pound drum of white paint onto or off from a pallet. Glad the new toy is safely garaged!